It took more than an hour and a half to inch our way through Worthing. A lorry puncture causing A27 havoc at a spot which always congests. Our hopes of avoiding the worst of the Friday traffic well and truly dashed. It could have been a lot worse, though. The sun was shining, the windows wound down. Egypt and Uruguay were providing the audio entertainment (via the World Cup in Russia), and Chris is always good company. Even in a traffic jam. Oh, and we were going fishing in the morning. Opening weekend was always going to be fun and so it proved. Garrett played host to Chris and myself, Martin and Nick, and fuzzy heads at dawn on the 16th were assured. We sat up later than we ought, but still retained a reasonable level of responsibility and found our way to the Haven without too many grumbles of discontent. Nick had brought his film equipment and Chris his notebook, so my telling of the events of opening day will end here. Suffice to say that floats dipped, afternoon naps were taken and the fish and chips, eaten on the bank and washed down with milk stout, utterly glorious. We got rained on at Waller’s Haven. Nothing substantial, just a summer shower or two, but more than we have seen at home in Dorset for a long, long time. As I write, in mid-July, eleven weeks have passed since the last significant rainfall. The upper Frome is shrinking by the day and the bowls of water that I top up for the birds are almost constantly in use. The last recordable rainfall came on May 1st, and prior to that the spring had been cold and wet. Much of the ground that had been blanketed in snow and then sodden with water is now a crumble of dust. And as the rivers fall to a trickle and the lakes begin to gasp, so I find the urge to fish lessen. Some angling clubs, and many anglers, have taken the decision to pause until the rains come and the temperature drops, a sensible decision – particularly for the safety of fish such as barbel. 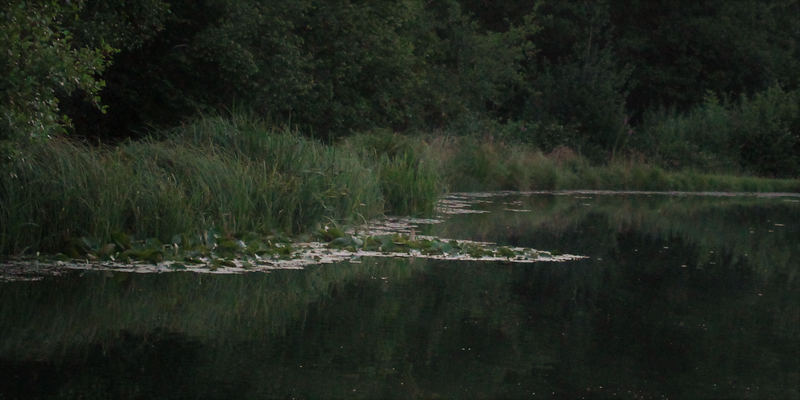 My local lake, where I spent much of last summer, is chalk spring fed, and as a result the water temperature remains fairly consistent throughout the year. The sunshine has encouraged weed growth though, and when I popped in to have a look this week it was almost unfishable. I had managed a couple of visits in June though, on each occasion waiting until the cool of evening before making a cast. On the first visit, I found two other anglers fishing the lake. They had 8 rods out between them, covering most of the water, and I decided to leave them to it. A few days later I had the place to myself, though, and settled into the end swim where I had caught from last year. The water level was a little lower than usual, and very clear, and I didn’t expect many fish to move until the sun was well off the water. And so it proved. Odd fish bubbled, and the float bumped a couple of times having being brushed by a flank or fin, but it was at least an hour before the intensity shifted and the tench began to feed in earnest. I missed a couple of bites, striking too early perhaps, and when I did make contact a small half pound tench came splashing in. Fifteen minutes later and another followed, this one around the pound mark, but then the swim went quiet. I plopped in another couple of dollops of groundbait and within a couple of minutes the fish began to fizz. The light was fading, but I was facing west and the light of the sky would allow me to see my float for a good time yet. 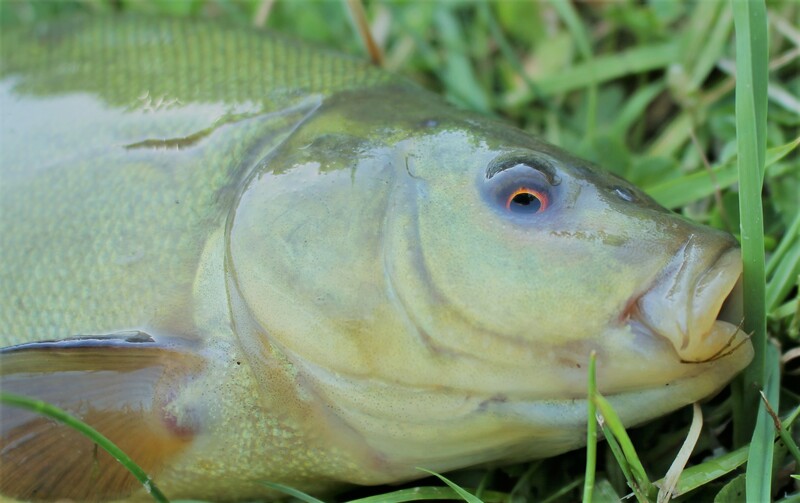 The tench seemed to be moving in and feeding hard, and I began to worry that I wouldn’t have enough bait to keep them feeding. I was adding a small ball every couple of minutes and bubbles were permanently pricking the surface. The float was barely still, but true bites were hard to discern. The increase in feed had drawn in a shoal of ravenous rudd and they shot about in a pinball frenzy, bouncing off the lily pads and rattling the float. Still the tench fizzed, though, and finally the float dipped decisively and kept going, and I was into a fish. 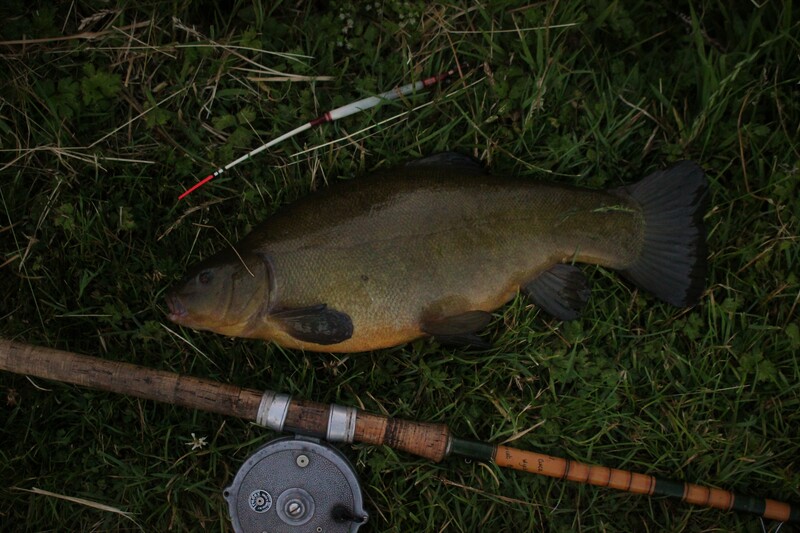 This was a better tench, and it quickly dived for the thick weed to my right. I didn’t panic but instead maintained a steady pressure which let the rod gently ease the fish free. Once up in the water, the fight was brief and I bundled a three-pounder into the net. I paused for a couple of photos in the half-light before dropping in the final crumbs from the groundbait bowl and setting the float once more. The rudd seemed to have switched off in gathering gloom, but if I squinted, I could still see the mass of bubbles from feeding tench. I missed another bite and then began to lose my vision to the darkness. The float was smudging against the ink and I could only see it if I looked slightly to one side. Fortunately, when it sank for a final time, I didn’t miss the movement. Again, this fish headed straight for the sanctuary of the weeds, and a similar battle ensued, although this fish had more scrap when it came up in the water. It was slightly bigger than the last fish and incredibly dark in colour, with a curling mass of paddle like fins. A spirited male tench that rounded of the evening perfectly.